This multipurpose miracle plant – called drumstick by the British and popularly known as Zogelei by Northerners is found in parts of Africa and Asia, and trust almost all the houses in Edo North, Nigeria. It has been made into tea and multiple health products across the globe, healing various ailments. Below are 10 amazing benefits derived from eating the seed or leave of this miracle plant. 1.The moringa leaves help in boosting energy levels in a natural manner, which is long lasting. They are also found to heal ulcers, restrict tumours, reduce arthritis pain and inflammation and control blood pressure. 2. 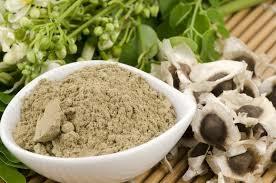 Daily consumption of moringa improves body’s natural defence mechanism. It is an immune stimulant that is often prescribed for HIV patients. 3. This multipurpose plant is rich in vitamin A or beta-carotene and acts as an effective weapon against blindness. 4. It plays an important role for lactating mothers. Consumption of moringa is reported to cause a dramatic increase in breast milk. 5. It is also effective when used by diabetic patients as it balances the sugar levels. Though that might sound ironic considering the sugary taste you feel in your mouth after consumption. 6. Increased consumption of junk food can lead to high cholesterol levels. Moringa helps in balancing the cholesterol levels in the body. 7. Consumption of moringa leaves stimulates metabolism and cell structure of the body. 8.This plant also has several antibacterial properties and can be used as a purifier. 9.The seeds of moringa contain 40 percent edible oil known as Ben oil. This clear, sweet and odourless oil is rich in antioxidants and is similar to olive oil in terms of its nutritional profile. It has an indefinite shelf life as it does not turn rancid like other oils. 10. Moringa leaves are the most widely used part of this plant. They are edible and contain three times more iron than spinach. And remember, when after eating the seed, remember to drink water and enjoy the sweet taste of water! Previous Post Dimeji Alara Goes To Hollywood! Next Post Short Listed Contestants For Miss New Nigeria World Beauty Pageant Unveiled!